Jules Bianchi would have replaced Kimi Raikkonen at Ferrari, says the team's former president Luca Di Montezemolo. The Frenchman died on Friday from head injuries sustained in a crash at last October's Japanese Grand Prix. Di Montezemolo said. "He was the driver we had chosen for the future, once the collaboration with Kimi Raikkonen had finished." Motorsport governing body the FIA is retiring car number 17, which Bianchi carried last year, in his honour. The FIA said: "As Formula 1 car numbers are now personally chosen by each driver, the FIA believes it to be an appropriate gesture to retire Jules Bianchi's number 17. "As a result, this number can no longer be used for a car competing in the FIA Formula 1 World Championship." Bianchi was driving for the Marussia team, which used Ferrari engines, and had been earmarked at the time of the accident for a promotion to Ferrari's other customer team, Sauber, in 2015. Di Montezemolo's remarks suggest that, had he lived, Bianchi could have driven for Ferrari as early as next year, as the team are currently considering whether to drop Raikkonen at the end of this season amid concern at the level of his performances. 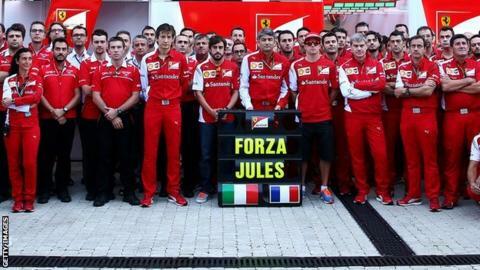 Di Montezemolo, who was replaced by Sergio Marchionne shortly before Bianchi's accident last year, told Sky Italia: "Jules was one of us; part of the Ferrari family. "The Suzuka incident took away from us a first-rate person; reserved, quick, very educated, very close to Ferrari, who knew how to interact with the engineers. "In short we lost a driver with a certain future." Former Ferrari team principal Stefano Domenicali, who resigned in April last year, added: "Jules was always at Maranello. Every day he came to the factory to grow and nurture his dream of driving for Ferrari. "Our idea was that, after Marussia, he should go to another team to grow and be ready for the big leap. That is what we planned some years ago. But unfortunately fate took him away."